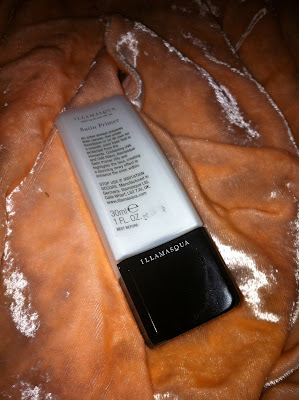 Illamasqua is a British based cosmetic company devoted to "makeup for your alter ego". I had run across it on one of my visits to London, tried some nail varnish, and fell for the deep pigmentation and long-lasting wear. The line in general reminded me a little of what Urban Decay originally was (I was one of the first boutiques in NY to carry UD before they went mainstream and they've changed quite a bit), with the professional aspects of theatrical makeup, similar but definitely not the same as Mac. I love Mac, but Illamasqua is more extreme with very high concentrations of pigment and the line can be used by professionals without having to go the "pro" route. I'd say the prices compare to that of Mac. I'll start with the items I purchased through Sephora, and available in the US. FYI the colour swatches are much truer on the Illamasqua site than on Sephora. Many -- not all -- of their nail varnish colours are carried by Sephora, and if you're looking for an introduction to the line this may be the way to go. The colours are highly pigmented, and I'm very impressed with their long wear. They have a wide choice of interesting colours, and one of my favs is "Rampage" which is a creamy very dark green. 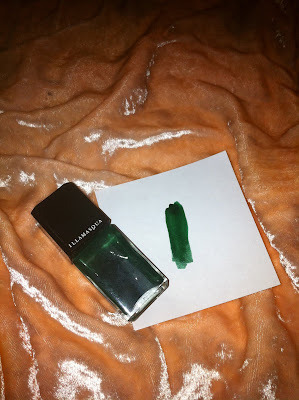 It's described on their site as "dark green jelly, glossy finish", and Sephora describes it as "dark forest green, glossy finish". I'd say it's not quite forest green as there's some blue to it, after applying two coats its so dark it will come off as a green-black. I'm biased as I love green, and have the collection to prove it! But this is unique and I wear it often when I'm bored of frosts or glitters. It holds up better than many high-end brands (I'm looking at you Chanel -- they may have fantastic colours but it chips like crazy within the day, even with a top coat... sadly I've purchased my last and will no longer buy into the hype, if other brands can get it right they should be able to as well) and I do intend to try a few more interesting colours! Next I purchased a few things at once; lipstick, primer, and cake eyeliner and sealer. 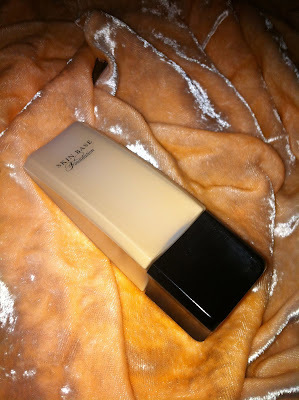 Let me preface my reviews by saying it was difficult to try and capture the effects of the primer and foundation in pictures, so I apologise in advance for the lack of quality photos. 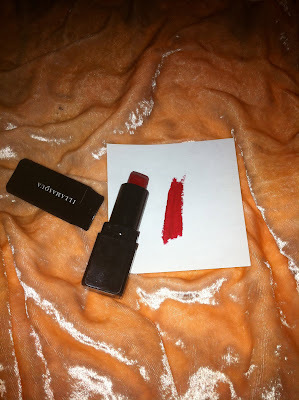 The lipstick I purchased was the shade "Maneater", a "classic cherry red". (Again, Sephora doesn't carry the full range, so having a look on the Illamasqua site you may find shades more to your liking. Hopefully as it gains popularity here, Sephora will carry the full line, or even better Illamasqua will open their own boutiques here!) It goes on just as it looks in the tube, and is a matte formula. I tend to go for mattes as they last longer before having to reapply and I honestly don't like too much frost on my lips. The lipstick is formulated without SPF, and this is so that in both photography and film the colour will read true. I had the chance to test it when I was at the Brian Froud reception last week and the photographer for the event took my photo. My lips were indeed the same colour as when I applied it hours before! (If I get permission, I'll post the photo.) It's on the dry side as its matte, and if you don't care for that this is easily remedied by using a lip balm (with SPF to combat any sun damage) underneath. (It won't change the colour or the wash-out you get with film or photography.) I will definitely be purchasing more of their amazing colours -- as a red lipstick obsessive, they have so many glorious shades to choose from (and many other scrumptious shades!) I'm definitely a lipstick woman and have given up on sticky gloss that wears off immediately. 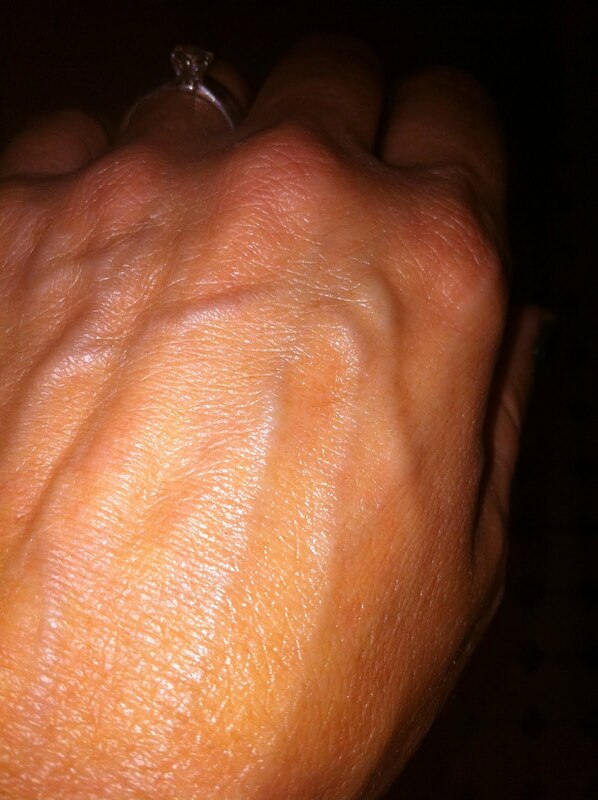 Satin Primer on my hand. The "Satin Primer" can be used alone or under foundation to create a smooth canvas. "Containing UVA and UVB filters, Illamasqua Satin Primer lifts and highlights the face, creating a stunning dewy effect to enhance the siren within." Since my skin is very dry, I'm forever trying to get that "dewy effect" so I decided to try this as opposed to their "Matt Primer" which would seem better for oily or combination skin. 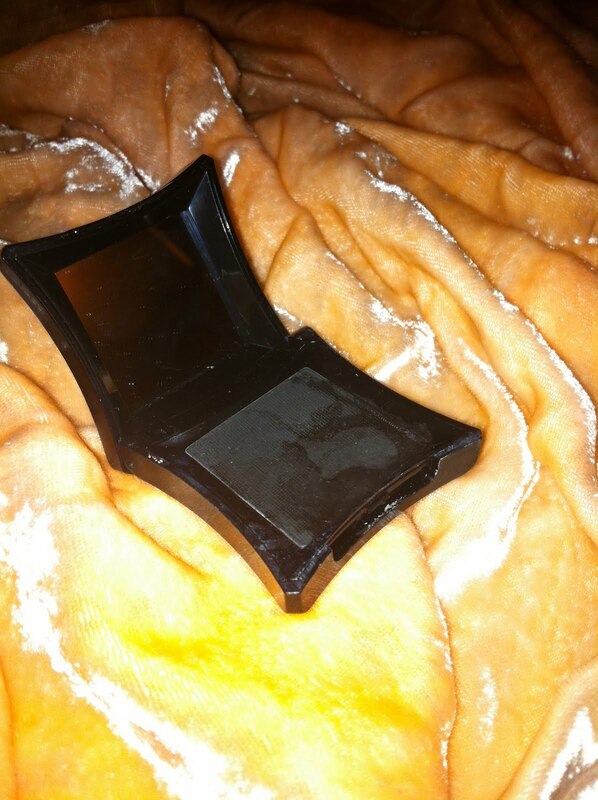 The effect is lovely, and it does indeed give my skin a dewy look under whatever foundation I use. 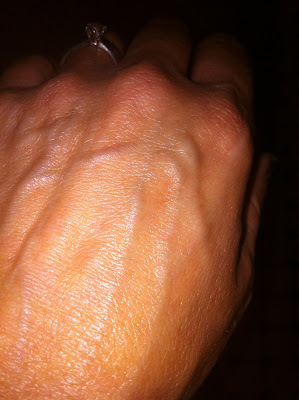 It's dewy, not glittery, giving just the right amount of moisture my parched skin needs, and keeps it hydrated all day. Definitely will purchase again when I'm out. Cake Eyeliner in "Mislead" pure black. Cake eyeliner was my choice for many years as I could get the consistency -- either dark or more sheer -- depending on how thick I made the paste. I worked with theatrical palettes of water based face paint, down to cheap cake eyeliner and I loved all of them. I also purchased the sealing gel, as I thought this would be great to seal the eyeliner. One big problem I always had with cake eyeliner is that if my eyes teared (and they always seem to tear due to allergies), the eyeliner would come off in spots. The sealing gel solves this problem. While I really love this product, the jury is still out for me as its been too many years of using gel eyeliners that I think I'm a bit out of practice! When I get it right, its fantastic, but if I don't get the consistency thick enough, its wishy-washy. With a little more practice I will probably come to love it as a staple as it was for me for so many years. Until then (how do you get to Carnegie Hall?) practice, practice, practice! Now on to the products I had to order directly from the UK. The bottle sits on it's side. Note the interior of the box, when you remove the bottle it reveals a full moon! I love perfume and when I had my shop I made my own witchy blends for darn near any magical intention and sometimes just for fun to create a new scent for myself. I even wrote a chapbook outlining how to make incense and oils and taught hundreds of hundreds the same, and have in my archives a much larger expanded book version which also includes baths, and scented candles (yeah, one of these days I'll finish it and send it off to my publisher). I used to love playing mad scientist and coming up with unique blends, and I had testers that would test out the blends for wearability as well as their magical properties. As a little girl I used to look forward to Xmas and lovely almond scented Jergen's lotion, as well as Tinkerbell cologne! I adore fragrance and wear it everyday even if I'm staying home! My tastes run pretty eclectic, from the white flower based "Fracas" which I've been wearing since I was about 18 (definitely not a scent to slather on, nor does it agree with everyone's body chemistry), to the clean, citrus scent of Cristalle Eau Verte, to more masculine scents sometimes even resorting to wearing men's cologne. I'm always on the lookout for new scents, and await new fragrances as many await the new fashion collections. One of the things I look forward to when traveling overseas is getting new perfume before it becomes available on the US market, it always feels special to have it before anyone else here. When I found out about the launch of Illamasqua's first scent, "Freak Eau De Parfum" I was smitten. Reading the ingredient list to a friend, they asked if I had sold the recipe to Illamasqua as it was so very close to some of my magical blends! I became more and more intrigued, and I finally decided to purchase it before trying (c'mon Sephora, get with it and put it for sale in shops so we can try before we buy!) something I NEVER do, as scent is so individual and will always smell different on each person due to everyone's own unique body chemistry. Of course on Sephora it sold out. 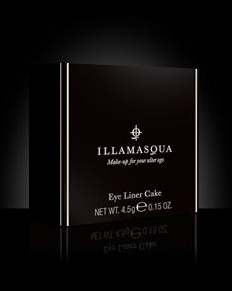 Disappointed, I cheered when I realised I had a birthday discount coming up from Illamasqua and I was able to order online directly from them. The anticipation was killing me even though it took less than a week to arrive. I tore open that box faster than you can say "belladonna" and set to testing it out. Here's what I found. While Illamaqua is marketing "Freak" as a unisex fragrance, at first the scent of flowers is seems very feminine. The "top" notes are of night-blooming flowers such as Black Davana, Opium Flower, and Belladonna. The "heart notes" are Poison Hemlock, Datura (one of my faves, Moonflower), and Queen of the Night Blossom (also known as Cereus -- a night-blooming flower that blooms just one night a year). "Base notes" are Frankincense, Oud (aloeswood, or agarwood), and Myrrh. It's this base note mixed with lingering heart notes after the top note has faded, and why I can see this as a unisex fragrance. It would seem this would be a very heady blend, but it mellows out into something very intriguing, and I adore everything about it from the unique bottle shape (with a little snail crawling up the side!) to the scent itself. "Freak" has found a permanent spot in my fragrance wardrobe! This small amount will cover my entire face (it's actually a wee bit too much.) The coverage I like is light, so if you want heavier coverage, you'd use a bit more to build until you get the coverage you like. I've been a devotee of Bare Escentuals mineral foundation for quite a few years but recently noticed I'm getting very bad eczema patches and flaking (during the summer when my skin tends to be more hydrated due to more oil production no less) whenever I wear it, so decided I needed to try something new. I had read about the launch of Illamasqua's new Skin Base Foundation, based on (but not exactly the same as) Japanese Beauty Balms. Skin Base does not have SPF for the aforementioned reasons, however wearing SPF under solves the problem. The more I read reviews and watched YouTube tutorials, the more anxious I was to try their product even though the verdicts on these reviews were quite varied. Not yet sold in the US, this was something I also had to order blind as I had only their suggestions (they have a list of popular brands and the comparable colour in Skin Base) and the online swatches to go by. I thought SB7 would be perfect, but it's been out of stock for some time so back to the drawing board. I ascertained that SB8 was just a touch darker, and after reading many reviews that said their Skin Base tends to run on the light side I decide to try this. Tried to show the luminosity after just a light application. (Whew, bad lighting, I look yellow!) Hard to tell, but I only used a light hand under my eyes and my dark circles have nearly disappeared! One more coat and you'd never know I had dark circles at all! Oh and I don't have dark patches below my cheekbones, that's shadows as my cheekbones are naturally defined. You can also just about make out the "Maneater" lipstick. Again when it arrived, I was thrilled and ripped open the package (packaging presentation is gorgeous, but I tend to be a packaging whore!) trying a swatch on my hand. 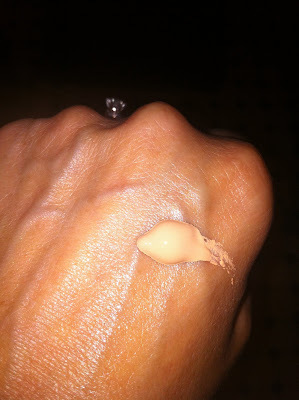 No one could tell where the foundation was swatched! So I went ahead and tried it on my face. I used my regular serum and moisturizer, and Illamasqua's Satin Primer. It applies so silky, and with my dry, eczema prone skin it provided just enough moisture to give me a dewy look without it being oily. I'm sure the Satin Primer added to this effect. The coverage was perfect -- I don't need heavy coverage, just enough to even out some sun damage on my cheekbones, and my horrid dark (they look black and blue without concealer!) circles. This is buildable coverage as I learned with my dark circles. A light hand wasn't enough to cover them completely, so another light coat and I didn't need concealer! Now this alone is a huge thing for me as I'm constantly searching for the perfect concealer (so far Mac, the new one from Rimmel, and one from Boots that I can only get in the UK are the only that do the job) usually to be disappointed as my circles are so bruised looking its difficult to conceal them and make them blend with the rest of my face. I didn't have any issues with flaking, no oily spots as some reviewers noted, and the finish is beautiful and very natural looking. One thing I noticed with the Bare Escentuals is that even though I have small, tight pores, they looked quite big and I could never use it under my eyes as it enhanced every single line no matter how fine. Not so with the Skin Base, my pores look normal and I've already explained the miracle it performed under my eyes! I will probably purchase the lighter SB7 when it comes back in stock as I usually have to blend two or more colours of foundation to get just the right shade (I mix three or four BE shades to get it right) anyway. While it doesn't look dark and it looks quite natural, to me it appears ever so slightly darker than my natural colouring so a mixture is probably the way to go. One note on application: Skin Base tends to dry quickly, so I suggest doing one part of your face at a time so you don't wind up with blotches of foundation every so often! I tend to work fast, using a foundation brush so I didn't have this problem, but one time I stopped to do something I noticed it was harder to blend. Now that I've tried a varied selection from their range, I'm sure I'll be trying even more. I love their philosophy, the products are of superior quality, and frankly cosmetics have gotten so expensive even at the drug stores (seriously, our local CVS sells L'Oreal HIP gel liner for just $1 cheaper than Mac, and it dries out immediately!) that I'd rather wait and get good quality for just a little bit more. One more thing I'd like to note is their connection with the S.O.P.H.I.E. charity. The Sophie Lancaster Foundation was set up upon the death of Sophie (only 19) at the hands of young miscreants who decided they didn't like the way her and her boyfriend looked (they were goths). It stands for "Stamp Out Prejudice, Hatred, Intolerance Everywhere" and is something close to my heart as there were many times back in the day I had to run for my life while being pelted with bottles and rocks, and the Punk Glam Princess has experienced bullying and worse at a very young age due to her appearance (and yes, I raised hell at school and got them to implement more policies on verbal abuse/ bullying of all types.) Sophie's birthday would've been just three days before mine, so it became even more apparent that I wanted to do something to help. 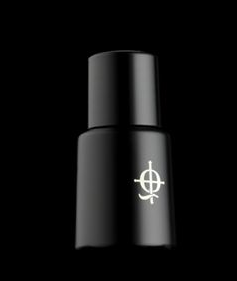 Illamasqua has several ways you can help; donate £1 to the foundation, purchase a S.O.P.H.I.E. eye pencil and £3 goes to the foundation, or do as I did and purchase a wristband for £2 and all proceeds go to the foundation. My reasoning is that by wearing the wristband I hope it will raise questions so that I can bring this important issue to light. I've written to the foundation, and should they ever decide to expand to the US, I will be first in line to help spread the word. You can read more of Sophie's story and what the foundation aims to do here. Here is the film that was created to get foundation's message out. Music is "Road" by Portishead. I hope these reviews were helpful to those of you on the fence, and perhaps some of you may have already experienced the great quality and fantastic colours Illamasqua has to offer. What are your favorites? PS Just ordered two new products from Sephora, and will review when they arrive!